Deviant Moon Inc. (A.K.A. Fenwood Asylum) was founded in 2015 by Patrick Valenza. Browse the Asylum for strange tarot decks, original artwork, and other oddities. Please be advised that the management is not responsible for injuries incurred while window shopping. WIP=The Plant #23 Deviant Moon Oracle. Back to work on the oracle after a bit of a detour the past 2 months. The deck WILL be finished this summer! Promos, news, and mischief delivered right to your inbox! 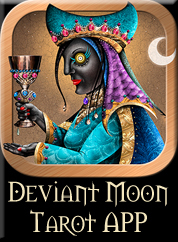 The long awaited Deviant Moon tarot app is here! Works with your IPhone or Android!